Are you planning on building a new garage? Chances are you’ve selected just the right garage plan to satisfy your needs and complement your home. But what will make your new addition more than just another garage? The perfect garage door(s)! Garage doors come in a wide range of sizes, styles and colors ensuring you’ll find the perfect one to give your new garage a stylish look while reflecting personal tastes. Overhead doors are available with or without windows and are made from a variety of materials such as steel, wood, vinyl and fiberglass. Additional details lend architectural appeal contributing to the overall look of the garage door such as modern or Craftsman style. With the right style overhead door, your new garage will have plenty of street appeal and extra charm. You’ll find an array of garage door styles to choose from online. Browse online garage door sites like Precision Garage Doors St. Louis to get some ideas. Does the garage door complement the architectural style of your garage and accompanying home? Is it available in a color that blends nicely with the façade? Is the garage door available with customizable options such as your choice of hardware or glass allowing you to have your own unique look? Are there any special safety features included? Also, check with garage door manufactures. Some offer a design tool by which you can upload a photo of your garage and “try on” all the different door options experimenting with color, style, etc., making it easy to select the right overhead door for your new garage. If you are building a new garage, there are many things to consider. One of those items to ponder is the type of garage doors you plan to use. Garage doors are available in various materials with the main ones being steel, aluminum, vinyl and wood. 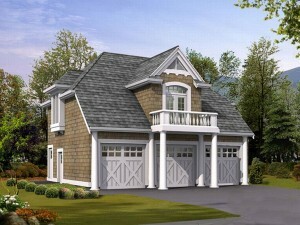 Wooden garage doors have been around since attached and detached garages have become part of family residences. They remain a popular choice in today’s market due to technical aspects, durability, longevity and visual appeal. Below is a list of the pros and cons of wood garage doors to help you determine if they are a good choice for you. They are custom built to fit any size or shape garage and can be created or adjusted to accommodate non-level garage floors. Their custom-built nature ensures your garage door will have a one-of-a-kind look. Natural material treatments are available to increase the longevity of the garage door by protecting against bending, rotting and distorting. They do not crack or dent like vinyl, aluminum and steel doors. Should the garage door become damaged, it can be repaired easily by replacing the damaged portion or panel rather than replacing the entire garage door. They can be operated manually or automatically with a garage door opener just like other varieties. These garage doors can easily be repainted in the future giving them a whole new look. Wood can withstand drastic temperature changes and it serves as an insulator against heat and cold. Wood cuts down on noise pollution dampening the sound of noisy neighborhoods better than other garage door materials. Wood is a renewable resource and therefore wood garage doors are earth-friendly. Wood garage doors blend well with homes featuring an exterior made of natural materials such as wooden siding, cedar shingles, logs or stone. · Wood garage door manufactures are hard to come by. · These doors are more expensive to build than their manufactured competitors. · Due to their custom-built nature, wood garage doors are not readily available at a lumberyard or home improvement store. · Regular maintenance is necessary to prevent damage and rotting. 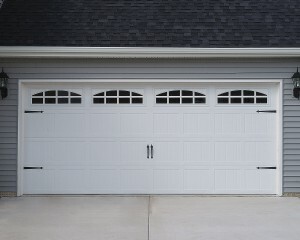 · Wood garage doors are heavy requiring a properly sized garage door opener and springs to move the weight of the door. Before you choose a garage door for your new detached garage, The Garage Plan Shop recommends you carefully consider the advantages and disadvantages of every type of garage door including aesthetically pleasing and durable wooden garage doors.